Please note that the Transmission CD in the picture is no longer used and not provided. (Transmission is now done online). We have been running 24 hour holters (ECG’s) on my boxers for many decades every year, allowing me to be fairly certain that there is no cardiomyopathy in my breeding program. For many years, we have paid the $400-$500 fee to run the 24 hour holter and have it interpreted. Occasionally, after taking our dog to be hooked up, returning home for the 24 hour period, going back in to have it all removed and sent in for interpretation, we found out that the holter needed to be hooked up and run again due to faulty hookup which causes artifacts in the data produced. We invested in a top-of-the-line digital Alba monitoring system, a great vest in two sizes for smaller and medium sized dogs, and learned from cardiologists how to properly do the hook-up and which electrodes and tape work best. We use this equipment to holter my own dogs each year. However, it is not in use most of the year and we wish to offer it to other breeders/dog owners who would like to holter their dogs. We put together a package that contains most everything a person needs to holter a dog down to the skin wipes and tape. The only thing you might need is a shaver and some Gold Bond powder. 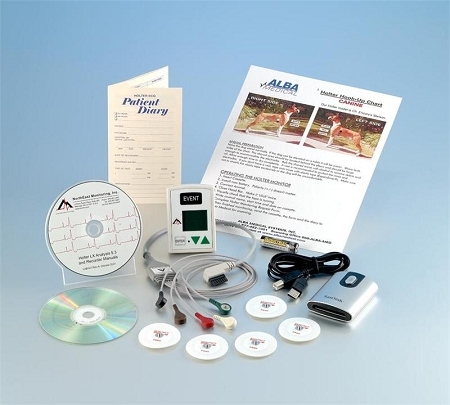 We send you a complete holter package for ten days, excellent instructions, photos, and the materials to submit to Alba for a complete report. We provide locking electrodes which are high-end and don't come loose even with an active dog. They come with the holter package and we offer extras in case you accidentally destroy one during the hook-up. Additional Hook-Up Kits are also available in this store. You can holter as many dogs as desired during the rental period. There is some debate about the value of shaving dogs before attaching electrodes. Some breeders choose not to shave and believe that they receive excellent results. In over four decades of running holters with board certified cardiologists, we have never seen a hookup done without shaving. Shaving reduces the possibility of artifacts which must be ruled out by technicians who review the data. Our instructions recommend shaving to give you the best possible results. Once the dog wears the holter for 24 hours, the data is stored on the recording device (SD for digital; tape for analog). This information is sent to Alba to interpret and produce a report for you and your veterinarian. Alba's charge is separate from the rental of equipment. Charge is currently $30 for digital interpretation and report generation from Alba. Contact Alba to verify current charge. Contact me through the store for the rental contract or print using the link below. (Scroll down and click on Rental Contract for Digital Holter.) A $400 refundable deposit must be paid prior to shipment as a security deposit. Once the system is returned and evaluated, the deposit (less any late fees or fees for damage or replacement) is refunded through Paypal. See below to pay deposit. SHIPPING: PLEASE CHOOSE PRIORITY MAIL OR PRIORITY EXPRESS WITH INSURANCE. STANDARD POST DOES NOT HAVE TRACKING AND MAY TAKE OVER A WEEK TO GET TO YOU. If the store does not calculate enough shipping to cover priority with full insurance, you will be asked to pay the difference before shipment. Priority Mail charge is typically around $35-$40 in a Medium Flat Rate Box. You are required to ship back using 1-2 day shipping with tracking and full replacement insurance as well. I will definitely be renting this again! I did my first holter ever using this kit. The instructions were clear and it was very user friendly even for the inexperienced. The package was fully complete so no need to purchase anything extra! Plus, it's very economical to be able to do it yourself! I will definitely be renting again it for yearly clearances! I have to admit it looked like quite the undertaking. But after receiving the Holter Monitor System as well as incredibly detailed directions & with the Support of Paula from Gentry's Boxers I was able to confidently Holter my Boxer boy! I will definitely be using this rental again in the future! Excellent experience! My wife and I recently rented the Cardiac Holter Monitor System for use on our pet. We had never used one before and solicited the help of our primary Vet with the shaving and electrode placement. If you own clippers you can easily do this yourself as Paula's instructions included with the rental walk you through the entire process step-by-step. The digital monitor was very easy to operate, of high quality and the vest fit our pet perfectly. Paula provided excellent customer support answering my questions immediately over the phone and was very generous with her time and graciously shared her knowledge stemming from 45 years of experience. Alba Medical also provided excellent customer support answering my questions regarding running sequential events. We uploaded our files to Alba Medical after business hours one evening and had our reports by noon the next day. Great service all around, 5-stars all the way! This was a great option for examining the heart rhythm of my 8 year old boxer. Thru the vet cardiologist it would have been about $400 so this was much less expensive and very easy to use. It was easy to use and gave us all the information we needed. Thank you Paula! We debated between renting and buying a holter, to do annual health screenings. As our first ever attempt, we chose to rent the equipment as opposed to buying and I am very glad that I did. Paula assisted me through the entire process and was always available to answer questions. Despite computer issues, she ensured that I was able to complete the rental. We promptly received the monitor after placing our order. The kit provided very easy to follow instructions for hooking up and removing the monitor, as well as submitting to alba medical. Alba medical quickly provided the necessary results in an easy to read and understand format.